Progress toward closing the gender wage gap in the United States looked very promising in the 1980s and ’90s. As women increased their level of education, eventually surpassing men in holding college degrees, and entered the workforce in droves, these gains in education and job experience (along with a pernicious stagnation in men’s wages) resulted in a speedy narrowing of the wage gap for decades. Then, around 2001, this progress ground to a halt. The gender wage gap — currently, women make 79 cents for every dollar earned by a man — has barely budged in the last 15 years. At this rate, women in the United States will not see equal pay until 2059. READ MORE: Will business imperatives drive gender parity? But there are signs that women may not have to wait that long to see equal pay. Earlier this week, Republican Gov. 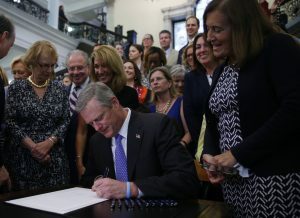 Charlie Baker of Massachusetts signed an equal pay law that is the most comprehensive statutory attempt yet to address gender pay inequality in the country. It is the first bill to stop employers from basing their initial salary offer on a potential new hire’s salary history. The Massachusetts law is notable in three ways. First, in addition to cracking down on employer retaliation against employees who share their salary information, it is the first bill to stop employers from basing their initial salary offer on a potential new hire’s salary history. This provision concretely addresses one of the most common ways that employers unwittingly import pay discrimination, shifting the salary consideration from a focus on the value of an individual (based on their past or current compensation) to the value of the job they need done (based on what they believe the job is worth to company or organization). A 2015 California equal pay bill with a similar provision passed both chambers, but unfortunately this requirement wound up on the cutting room floor of the final bill. Second, Massachusetts’ law is the first to explicitly address one of the (proclaimed) barriers to employer action on pay discrimination by ensuring that employers, who can show they are actively taking steps to address pay discrimination identified through internal monitoring, will be given a certain amount of leeway time to address that problem and thus reduce their risk of being sued for pay discrimination. This provision is doubly notable, because it shows the active involvement of employers in the drafting of the law. Since 2013, the Boston Women’s Compact has been leading the nation’s employer-based efforts to tackle equal pay: Over 100 employers agreed to the common goal of reducing the gender wage gap, monitoring their own practices and holding each other accountable for progress. In spite of more than 50 years of federal equal pay legislation, such systematic self-monitoring remains uncommon. The law explicitly says that maternity leave cannot be taken into account as lower attendance or seniority. Finally, the law includes an important recognition of the burden of caregiving on women’s lifetime earnings potential. The law explicitly says that, while seniority (i.e., time served on the job) is a legitimate reason for pay differences, maternity leave cannot be taken into account as lower attendance or seniority. Case law already recognizes this fact: The largest gender discrimination case ever, resulting in a jury finding of $250 million in punitive damages against pharmaceutical company Novartis, partly involved the reduction of women’s bonuses because of pregnancy-related leave. The Massachusetts law codifies this in simple terms, hopefully making it less necessary in the future for women to have to go through the stressful process of suing their employer. READ MORE: Almost every country in the world offers more generous maternity leave than the U.S. While California and Michigan have had pay transparency laws on the books since the 1980s, those laws seemed to have had little impact, because few people knew about them. The same fate is unlikely for the new Massachusetts law and other recently passed equal pay bills in California, New York and Maryland. The laws come at a time when equal pay has received regular media attention and is high up on the political agenda. Several large companies have signed the White House Equal Pay Pledge, and the Equal Employment Opportunity Commission is in the process of requiring annual pay reports from employers. Women in Massachusetts lose about $14 billion dollars a year due to the wage gap and the undervaluation of women’s work. Perhaps the most promising sign that more serious efforts to address pay discrimination are in front of us is the increasing number of women lawmakers. Tellingly, two senior female administrators in Massachusetts championed the law. Electing more women, as well as male policymakers who recognize equal pay as an economic imperative, may help move the needle in other parts of the country. Women in Massachusetts lose about $14 billion dollars a year due to the wage gap and the undervaluation of women’s work. Tackling a complex policy problem such as the gender wage gap will require buy in from employers and policymakers, voters and advocates, women and men. Massachusetts shows that such cooperation is possible. 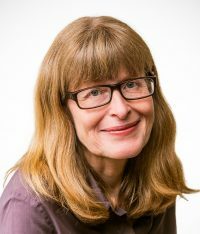 Ariane Hegewisch is the program director on Employment & Earnings at the Institute for Women’s Policy Research.